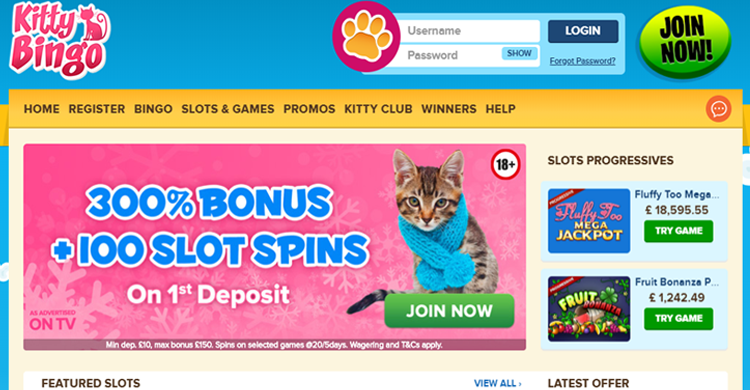 Kitty Bingo | Get Your £30 Bonus + 100 Slot Spins Here! Claim Offer – 300% Bonus + 100 FREE Spins! Kitty Bingo is the flagship offering from the LuckyJar team (Daub Limited). They also have two other bingo sites, one called Lucky Pants Bingo and the other Bingo Extra. The team themselves were previously involved in creating massive industry site Wink Bingo and as such have a brilliant reputation for providing exactly what players want – great bonuses, great promotions and a great chance of winning! Kitty was launched back in 2012 and since then has gained more and more market share. As far as the look and appearance of the site go, the abundance of cats might not be to everyone’s taste, but you can’t argue that the design itself is slick and is superbly formatted to allow a great gaming experience. Licensing is provided by both the United Kingdom Gambling Commission and Alderney, meaning you can rest assured that your cash will be safe in this fully regulated online bingo site. You will be entitled to a 300% first deposit bonus when you make your first deposit of £10. Plus, you will also get 100 extra free spins, which is a great way to try out the slots provided on the site without risking any extra cash. *Wagering requirements apply. See official website for full terms and conditions. Play with £40 when you deposit £10. 2nd and 3rd deposit reloads of up to £75. Game choices include both 75 and 90 ball bingo. There are a number of progressive jackpot games, where a portion of the ticket price goes to the jackpot, and it keeps on going up until someone wins it. If you are a budget player, you will be happy to know that there are plenty of games with a 1p ticket price. Or if you fancy yourself as a bit of a high roller, there are suitable big cash jackpot games to play for too. One thing we really like about this site is that you can deposit using PayPal. This allows you to keep your card details secure and not share them with the operator if you don’t want to. Like most standard online bingo sites, you will be able to fund your account with standard cards, as well as PaySafeCard and Neteller. Why not get started now and claim your 300% cash bonus, plus 100 extra FREE spins on slots. Welcome offers don’t get much rewarding and fun that this, as such if you have never played at Kitty Bingo before, we highly recommend you head over there today and get started now! Watch out for new promotions that launch each month, several of them require and opt-in, but they can be very rewarding and are most definitely worth claiming.